The WaveShaper 1000/SP is a Polarization Maintaining (PM) programmable filter which provides full control of the amplitude and phase spectra across the entire C-band. Typical applications include the creation and shaping of short pulses down to the femtosecond regime as well as programmable filtering for developing and testing of single-polarization and polarization-multiplexed optical communication systems. The WaveShaper 1000/SP transmits and processes the signal which is launched into the slow axis of the input PM fiber. The signal launched into the fast axis is not transmitted and will be extinguished by more than 20 dB. This instrument is available as a bench-top unit (1000S/SP) as well as an OEM module which can be integrated into customers' equipment (1000M/SP). 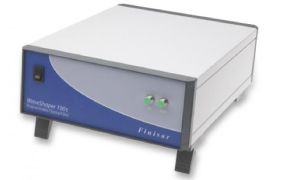 The WaveShaper 100S is a variable-bandwidth tunable optical filter which is optimized for use in R&D as well as in production test applications where the precise control over both the bandwidth and the center frequency ensures support for current test requirements as well as for next generation FlexgridTM-based networks and subsystems. Both Band-pass (flat-top) and Gaussian filter shapes are supported in a single unit. 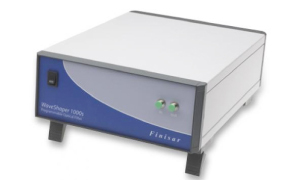 Based on Finisar's solid-state Liquid Crystal on Silicon (LCoS) optical engine, the WaveShaper 100S Tunable Optical Filter contains no moving parts. The WaveShaper 1000S Programmable Optical Filter supports arbitrary user-generated channel and filter shapes. The bandwidth can be set from 10 GHZ to 5 THz with 1 GHz increments for the standard C- or L-band version of the 1000S. The X version - which covers C+L band - supports filter bandwidths from 20 GHz to 9 THz. The required filter shape (both amplitude and phase) can be generated by the user and then loaded into the WaveManager software, which translates the user specification into the required optical shape. Band-stop and optical comb filters are also supported as is optical power control over a range of 30 dB for all filter types. The WaveShaper 4000S Multiport Optical Processor extends the capability of the WaveShaper 1000S including the ability to direct different portions of the spectrum to different output ports with different, arbitrary user-generated channel shapes for each portion of the spectrum. The Flexgrid™ option in the WaveManager software simplifies the emulation of flexible bandwidth WSS for advanced network development.